The American Hornbeam (Carpinus Caroliniana) is a small to medium sized deciuduous tree. It is a slow grower witha primarily global shape when mature. It is native to Eastern North American but can be planted anywhere within Zones 3-9. It is easily grown in moist soil in partial to full sun. At maturity it ranges in heights from 20-35 feet tall. It is quite resistant to pollution, pests and disease which makes for an ideal street tree. The Hornbeam is an attractively shaped, low-maintenance under story tree that is ideal for partially/shady sites. May be grown in landscapes or naturalized in woodland areas. The Hornbeam has leaves that are serrated and oval in shape, they are deep green in color during the growing season and change to yellow, orange and red in the fall. The flowers are small white and not very significant in appearance. The smooth, gray trunk and larger branches of a mature trees exhibit a distinctive muscle like fluting that has given rise to another common name of muscle wood for this tree. The wood of the Hornbeam was used by early American in bowl and tool making and can be polished to a horn like sheen. This wood is not commonly used as the small size of the trees does not produce enough quanitity to make it worth processing. Readily available at most nurseries in zones 3-9, the Hornbeam makes for a lovely addition to any landscape. The European Hornbeam is equally disease resistant but grows in more of a pyramidal shape whan mature. 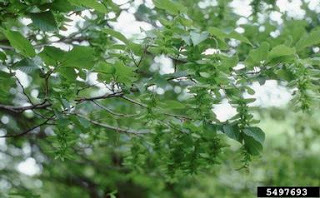 It is larger then the American Hornbeam overall with leaves that are shiny in appearance. The Virginia Pine (pinus virginiana) or Scrub Pine (as it is often called) is the most common Pine in the Mid Atlantic region, growing wild from Long Island, New York to the coast of North Carolina inland through the mountains of Alabama and Tennessee. The typical life span is only an average of 65-90 years. The average height is only 30-60 feet tall - falling into the small/medium size range. Virginia Pine is monoecious, it is wind pollinated and primarily out crossing in nature (fertilized by others), though self-fertilization is possible. The Virginia Pine grows wildly on farmland and neglected properties, quickly popping up in our general area with ease, along ditches, wood lines and other less manicured areas. It does so well in reforesting abandoned and cut over lands that it has become a principal source of pulpwood and lumber in the southeast. It easily seeds itself in loose dirt, road banks and freshly disturbed soil. Virginia Pine seedlings are more tolerant of low soil moisture than most other Pines, though they may survive when moisture is low, their rate of growth is noticeably slower on these sites. The Virginia pine's needles occur in pairs. They are twisted and range from 1.5 to 3" in length. They are relatively short when compared to those of other pines.The branches are stout and woody. The bark is typical for most pines. It forms plates that are reddish brown in color with shallow fissures or furrows. The bark has a coarse appearance. This tree responds well to trimming. It has also become one of the most popular choices for Christmas trees in the South. Virginia Pine seeds are consumed by many birds and small mammals. These animals help spread the seeds by carrying them to new places. Twigs and needles are eaten by White-tailed Deer. Young Virginia Pines are good cover for animals, such as rabbits. Older wood is often softened by fungal decay providing excellent nesting sites for woodpeckers. The Shingle Oak - Quercus imbricaria, is a large deciduous tree in the Red Oak Family. It is very similar in appearance to the Willow Oak but with leaves that are half as long, on a stem that is three times as long. It can be found commonly along US Route 50 from just outside of Baltimore heading West through Illinois. It is common in both the lower Ohio and central Mississippi Valley's. It's natural range seems to pick up where the Willow Oak and Laurel Oaks fade out from Arkansas to New Jersey. It is not commonly found in the East with the exception of MD, PA and a small portion of western NJ. With an average height of 65-100 feet it has a very broad crown when mature. One specimen in the New York Botanical Garden reached heights of 115 ft tall and 9 feet in diameter. The bark is light brown in color and scaled in texture. The leaves grow alternately and are 4-6 inches long and 1-2 inches wide. When beginning to bloom the buds are red in color but the leaves are a glossy green during Spring-Summer seasons. In the Fall they become a deep Red above and a Silvery-Grey Red below. The Acorns grow either singularly or double and are rounded and cupped in shape, ripening in the Autumn of each second season. With it's unusual large yellow-green strangely textured fruits, the Osage Orange (Maclura pomifera) tree is sure to grab attention. It is called by various alternate names such as Hedge Apple, Horse Apple, Bodock, Bois d'arc, and Monkey Ball. 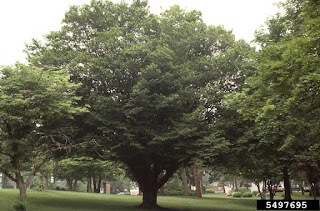 It is considered a medium sized deciduous tree and is native to the United States. It is believed to have originally been found in the Texas, Oklahoma and Arkansas region. It has been naturalized in all 48 continuous states and southern portions of Canada. The fruit resembles the texture of a brain and can grow anywhere from 3-6 inches in diameter. The inside of the fruit contains a sticky latex substance. The fruit is not eaten by humans because of it's unusual taste and extremely hard texture. Research has not found the fruit to be harmful to humans. just nearly impossible to eat. Many animals and livestock have been found to snack on this unusual fruit, however it is not a primary food source for any one type of mammal. The Osage Orange tree can grow 40-60 feet tall at full maturity. Despite it's name the Osage Orange is not closely related to the common Orange tree. The Osage Orange is part of the Mulberry or Moraceae family - while the common Orange comes from the Rutaceae family. The leaves are arranged alternately and are green in color during the Spring/Summer growth season. In the fall the leaves become an almost clear bright Yellow in color. The wood of the Osage Orange is heavy, close grained and dense. It was commonly used by Native American's in Bow making. Today the wood is used to create sturdy hand tools. The wood strengthens over time and withstands rot well. Meet the "Pecan" Tree - Carya illinoensis. A large domed tree, native to Floodplains and River Valleys in the Southeast and Central Eastern US. It's leaves can get up to 20 inches long, and are made up of 11-17 opposite, toothed leaflets. The flowers are a greenish color, the males have slender catkins in cluster of 3's, while females have clusters of 2-10 on the same twig. The Pecan is a member of the Hickory family, a small species with just 11 members in the Eastern US, 1 other in Mexico and 2 in South China. The Hickory family is part of the larger Walnut family-they have similar pinnate leaves and large fruits but differ in wingnuts, flower and branching structures. The timber is very tough, slightly elastic and shock resistant. They are not easily grown as the seeds can only be used when fresh, they also do not transplant well. The Pecan is widely planting throughout the United States for it's nuts, often in plantations. It flowers in the early spring and produces fruit in the fall. A pecan, like the fruit of all other members of the hickory genus, is not truly a nut, but is technically a drupe, a fruit with a single stone or pit, surrounded by a husk. The seeds of the pecan are edible, with a rich, buttery flavor. They can be eaten fresh or used in cooking, particularly in sweet desserts. Int he photo below you will see a shaker harvesting Pecan nuts from the tree.